Sacaduros! Another Alpha Baker musical number starring bread, butter and salt. 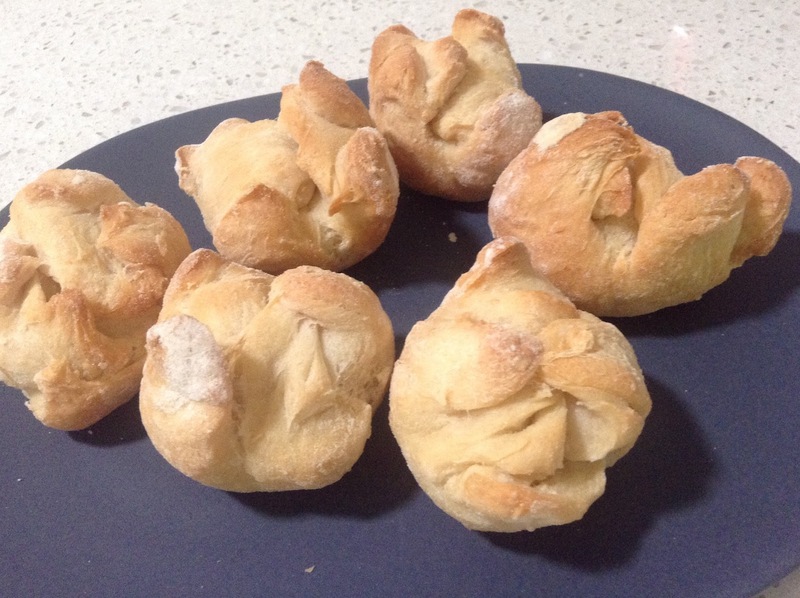 These little bread rolls are great. Not only because they're really more-ishly delicious but also because this is one project where being slapdash is advantageous. 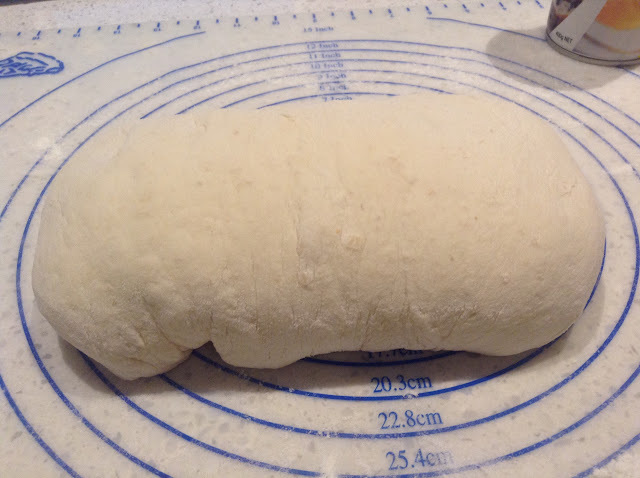 I know some of you are looking at the photo of my rolls below and thinking 'poor thing, she tries so hard'. But no! They're meant to look like that - or something like that anyway. I think they're really meant to have two neat little 'petals' adjacent to each other but the picture was a bit blurry so I think mine are within acceptable Sacaduros standards. The recipe called for half or three-quarters of the dough recipe for Hearth Bread in the Baking Bible (I can't remember exactly because it's a few weeks since I made them). My first question was why? Something to do with making a certain number of rolls perhaps? Anyway that just sounded too complicated to me and I made the whole amount. There can never be too many rolls, I say. 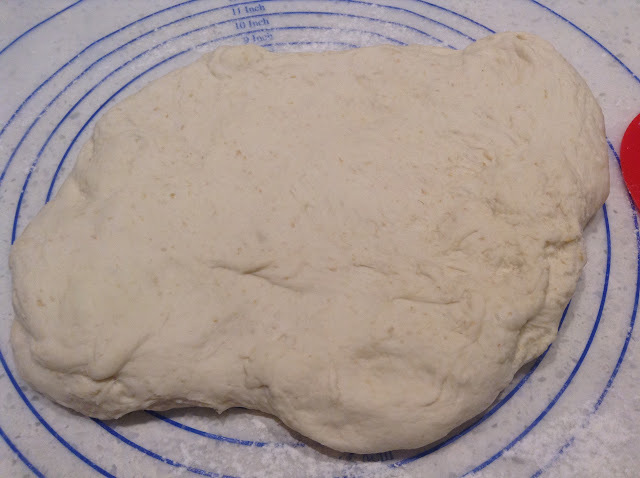 That's a rectangle of dough below waiting for a business fold, in case you were wondering. 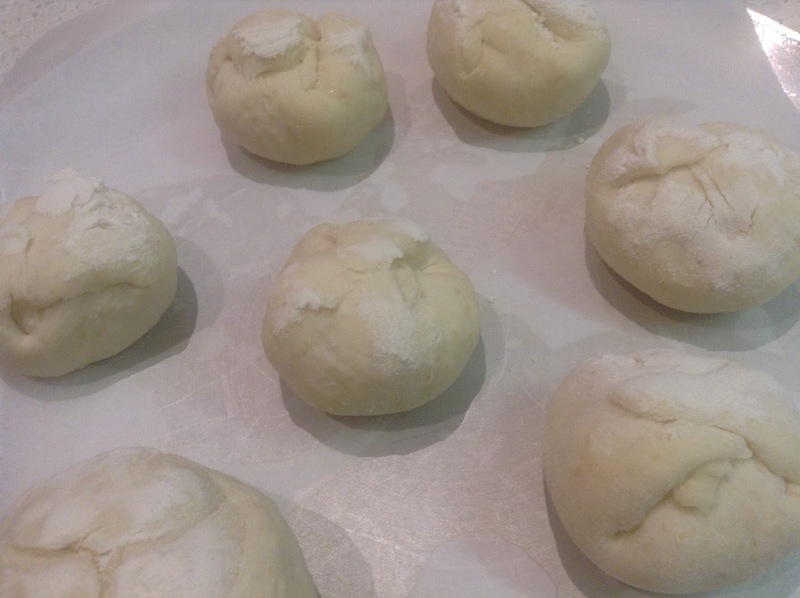 It was a bit unclear in the recipe whether the dough should go through the rising stages before shaping it into rolls. 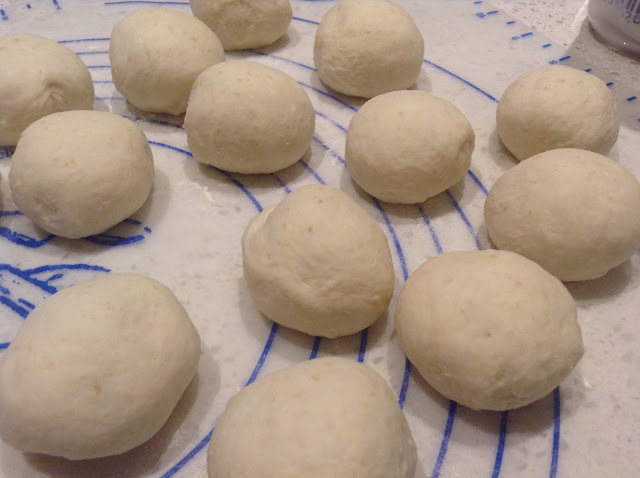 After studying the book and the posts of (the more organised) Alpha Bakers who had already made them, I decided that I'd put the dough through the two rises before I shaped them. 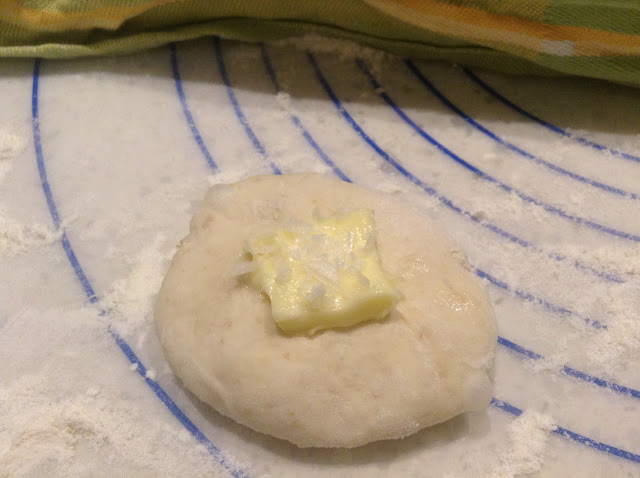 I notice that some people didn't do this and their rolls turned out fine so maybe this is just a bullet-proof recipe (my favourite kind). I'm not sure if any of you will believe me when I say I weighed the dough when I divided it into little balls. I don't know what's happening to me...next thing I'll be weighing biscuit dough. I must have been feeling more serene than usual because I really enjoyed the shaping process. The deliciousness in these rolls comes from the little piece of butter and smidgen of salt flakes you put in the middle of each roll. 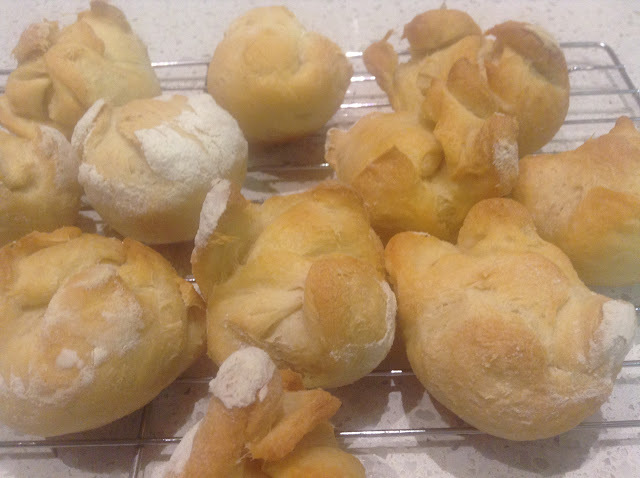 I used Maldon salt flakes which I had in the cupboard although the recipe suggests Fleur de Sel (which I don't keep and is probably expensive). To make the petals you fold the corners over the butter about twelve times, although I found the instructions a bit confusing and it was easy to lose count. 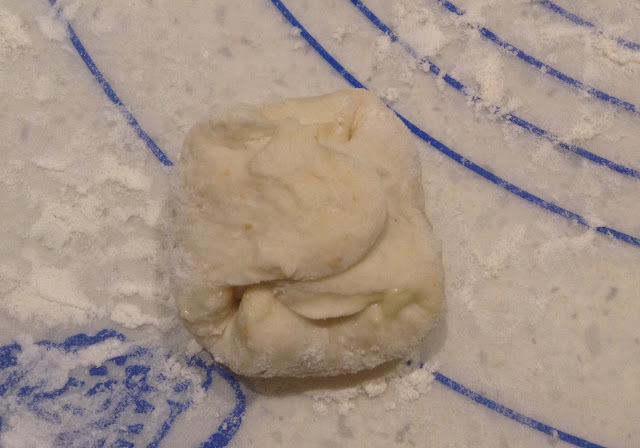 The key is not to seal the folds too well so you get the final folds of dough sticking up. I had a variety of results. Those rolls I sealed better were more solid while others ended up with wilder looking petals and were hollow in the middle. They were all delicious. The rolls are quite small which is great for a dinner party but I think they would be nice just a bit bigger too. 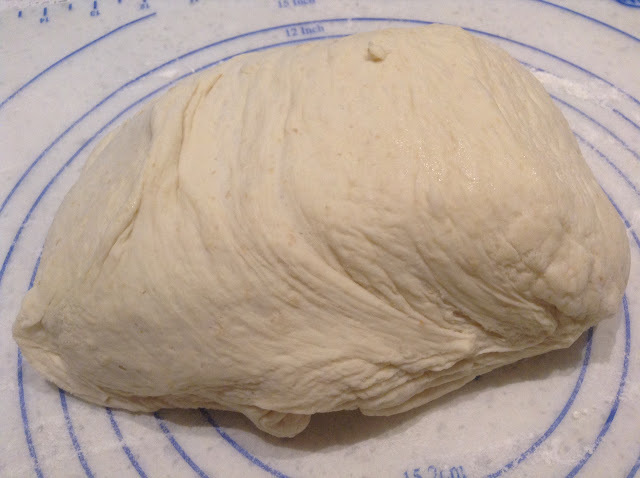 I made a larger one with the last bit of dough and it baked nicely. It was more solid that the smaller rolls and probably didn't have much in the way of petals but that might be because it was at the end of the production line and my serenity was fading. 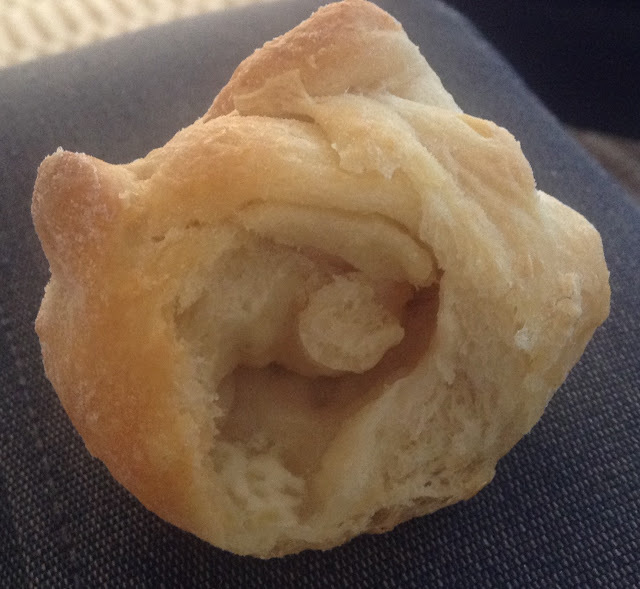 This is the hollow middle of one of the rolls. I can't tell you how crunchy and chewy the outside was. This is my favourite kind of bread texture and it's not that easy to achieve, as I've discovered in my past bread baking. I'll definitely be making these again. I still have to write up my post on the New Zealand Fig and Walnut Bread from last month and next month I'll be making Baguettes with the Bread Bible Alpha Bakers. Lovely and inspiring! I love the bit about serenity in relation to dough shaping; very accurate. I need to get cracking on these. The heat wave we are in the midst of is really fraying my nerves and apparently everyone else judging by the maniac drivers on the road. Also dealing with my husband's doctors is putting me in a most foul mood which definitely is not conducive to harmony in the kitchen. utterly charming--they look like they're hugging themselves which you should be doing as well! brava!! !